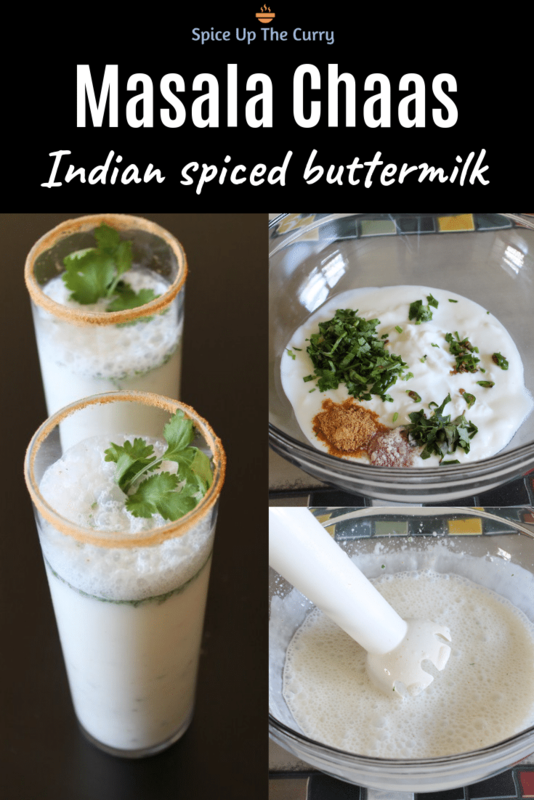 Masala Chaas recipe or buttermilk recipe – This is spiced, flavored Indian buttermilk. It is made with plain yogurt, green chili, cilantro, and spices. Is chaas good for you? Yes. In this hot summer, you need something to beat the heat. Chaas is a perfect beverage for hot weather. Chaas will help to cool your body heat. So this is the best drink for hot Indian summer. 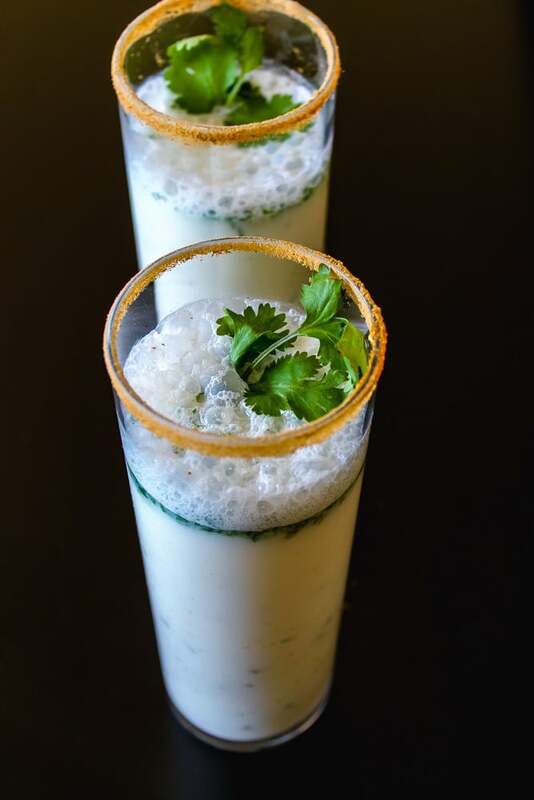 Whenever you come home from outside’s boiling heat, drink a glass of this Masala Chaas. It will give you very refreshing and cooling feelings. Apart from the cooling effect, it also helps in easy digestion. In Gujarat, if wedding or ring ceremony functions are in summer then, Masala Chaas is always there in the menu. In my family, we make Chaas every single day, no matter its summer or winter. We drink it after lunch/dinner. Each member of my family drinks at least 2 glasses of Chaas after or during the meal. Sometimes I make pudina chaas or vaghareli Chaas (Buttermilk with Tempering/Tadka) or plain chaas (without spices). 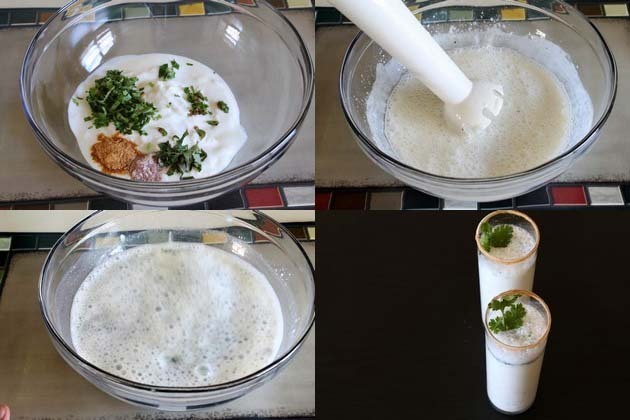 How to make Masala chaas? Take yogurt in a bowl. add all the ingredients except water and ice.meaning add green chili, cilantro, curry leaves, black salt, chaat masala, and salt. Blend it very well using a hand blender. So chilies and curry leaves are almost ground. So you don’t bite big pieces while drinking. Alternately you can use grinder or blender. Now add chilled water, blend again. So everything is incorporated well. Keep in refrigerator till serving. Pour into the glass and serve. For fancy serving, keep the glasses in the refrigerator for 10-15 minutes. In a small plate, take few spoons of chaat masala. dip the chilled glass into chaat masala, to get the decorated rim. Pour the chaas into a glass and serve. Always serve chaas chilled. It tastes best when served chilled. You can make Chaas ahead of time and keep in the refrigerator. Just before serving, stir and pour in the glass. 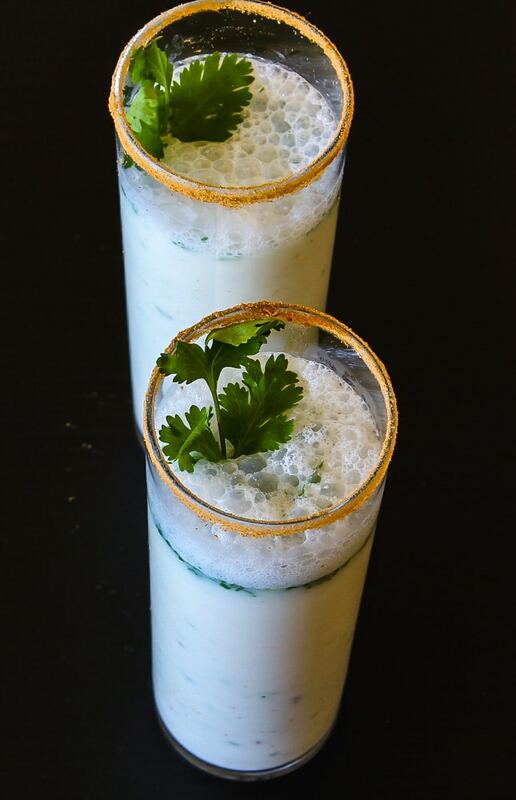 Masala chaas recipe is good for hot summer days. This is yogurt based Indian drink that gives cooling effect on the body and also helps in digestion. Take yogurt in a bowl. add all the ingredients except water and ice. Blend it very well using hand blender. So chilies and curry leaves are almost ground. Keep in refrigerator till serving. very nice and refreshing. I loved the glasses.